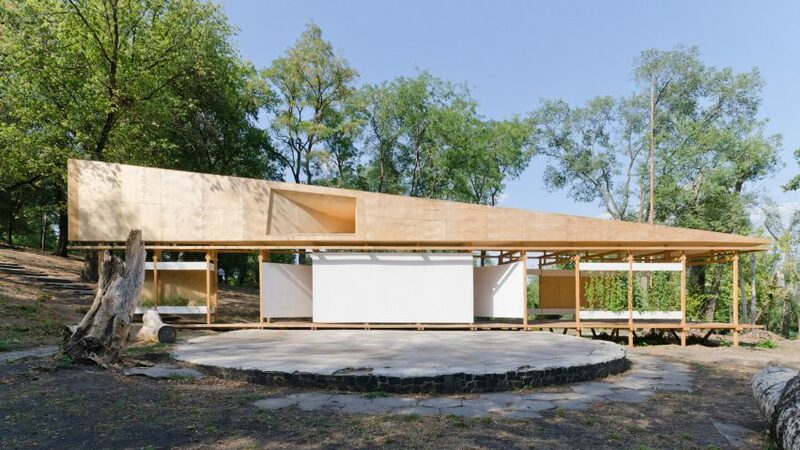 "Ukrainian architecture could be collective, lightweight and public"
Stage, the crowdfunded wooden pavilion that won a special mention in the European Prize for Urban Public Space, is paving the way for a new approach to architecture in Ukraine, says Owen Hatherley. Ukraine's big cities are some of Europe's most fascinating. Kyiv, Kharkiv, Odessa and Lviv are unique, stuffed with topographical and architectural excitement. But to find a decent building or public space built in them since the 1980s is exceedingly difficult. Dnipro, formerly Dnipropetrovsk, is a case in point. The city's many features – a fabulous modernist embankment built in the 1970s, an attractive, if monumental main street, delightful parks, a gorgeous but truncated Metro – are wasted or neglected. Plus oligarchs here, as in most other Ukrainian cities, have rammed into the cityscape at random their malls and skyscrapers, letting everything around them rot. Popular capitalism supplements this with clusters of kiosks where public spaces might otherwise be. This has changed very little since the 2014 uprising that overthrew President Viktor Yanukovych, and the subsequent Russian invasion of Crimea and the Donbass. So to see a project in Dnipro win a special mention in this year's European Prize for Urban Public Space is something new, a promise that things really could be done differently here than in Ukraine's overbearing northeastern neighbour. The project is Stage, a crowdfunded pavilion in the riverside Shevchenko Park. It consists of a stage, a screen and a lounge, with an acoustic tube on top, and was assembled on site from wood and plywood. It may be much like any other pop-up project, but it has bigger ambitions. According to its press release, "collective work is at the heart" of the building. It was "collectively designed online, by architects from Ukraine, Poland, Denmark and Italy", and its users, from dozens of local NGOs, wrote the brief, crowdfunded the materials, and then built it. This is ambitious stuff – the future of Ukrainian architecture as collective, lightweight and public, rather than individual, bombastic and privatised. The credited initiators are Kateryna Rusetska, Andrii Palash and Polish writer-designer Kuba Snopek, with Tomasz Swietlik as project architect, alongside a much larger international team working online and onsite to develop the idea into a building. When I asked Snopek whether the project was informed by the revolution of 2014, he said: "As I see it, Ukraine is, at the moment, full of civic activity of very different kinds. I would guess that this activity has always been there. The Maidan itself was both an emanation of this existing civic energy and sort of a new beginning, which ignited new bottom-up processes". He said there is "still a wave of enthusiasm, of building something new", though it has evidently resulted in little in terms of architecture, yet. Snopek is best known for the wilfully provocative book Belyayevo Forever, which argues for the UNESCO preservation of a standardised 1970s Moscow neighbourhood, on the basis of its green spaces and its role as a sort of accidental "creative cluster" for artists and thinkers in the Soviet 1970s. This puts his ideas rather at odds with the idea that Ukraine needs to ruthlessly de-communise its spaces in order to progress into some sort of better, European future. Snopek argues that Stage is also aimed at creating a contrast to the huge spaces of Dnipro, which was a showcase city of the Soviet military-industrial complex. "The question of scale has been one of the first that we had to answer in this project," he said. "Before we started designing, in March 2017, I went to Dnipro for a reconnaissance, during which I met with representatives of dozens of creative communities which were trying to organise various events in the city. These were really different communities: artists, musicians, fans of movies, etc. Yet they had two things in common. First, these groups have always been really small, and they all have been squatting very different places for their activities — some flats, small rooms in old office buildings. His belief is that nothing in the city is fit for purpose. "The city itself is very curious," he said, adding that its monumental spaces often too big and too bombastic for the its current needs. He thinks a change of scale, from gigantic to intimate, has been happening in the city for while. "We simply noticed it and gave it an architectural form," he said. "Kiev is a city where any and all public space is seized upon by parasitic capital"
What is most intriguing in the project, though, is the ambitions it has for the creation of new public space as something theatrical, political and spectacular, rather than as a neutral backdrop to coffee and shopping. It is the Jan Gehl approach to polite, European-style waterside public space that has, ironically, recently made great strides recently in Russia, but has so far made few inroads into a still determinedly chaotic, unplanned Ukraine. For Snopek, "the essential difference between Jan Gehl style public spaces and Stage, is that Stage is a non-commercial space". "It is a part of a public park, it was built and is being managed by an NGO," he said. "The rules of the space from the very beginning were very clear: everyone is invited. Whoever wants to organise an event, can feel free to organise one." Stage aims to be propaganda for itself, drawing attention to its own processes and ideas. Its site used to be an amphitheatre and Snopek said they preserved this function. In fact, the construction itself was a "performative process", where both design and function were totally public and visible – pretty rare for a city where architecture and planning are opaque and financially labyrinthine. So the fact that this had to be crowdfunded, in a city that is home to many of Ukraine's oligarchs – ie some of the richest people on earth – says a great deal. Snopek calls it ironic that they had to use crowdsourcing in a non-commercial project, but it's also surely the only way it could have possibly happened. How else would something that doesn't make a profit manage to get built? Either way, as a possible way out of the post-Soviet urban impasse, it's a whole lot more exciting than another art museum and coffee shop in a nice square in Moscow. Owen Hatherley is a critic and author, focusing on architecture, politics and culture. His books include Militant Modernism (2009), A Guide to the New Ruins of Great Britain (2010), A New Kind of Bleak: Journeys Through Urban Britain (2012) and The Ministry of Nostalgia. Photo is by Alexandr Burlaka.